I wandered out of my room after powering through the second half of Valley of The Dolls, mildly dazed. It was my own fault, really—466 pages in two days—but my reaction was less related to the sheer volume of pages I’d read than it was to the bleak final turn of the story. Having watched the movie halfway through the book, those final pages stood out even more. The film’s ending had been trite, not exactly happy, but it at least provided a reasonable resolution to the preceding two hours’ drama. The book’s denouement was a trap door, releasing its reader down into a black hole of unknown depth. “That was so dark,” I told Cameron, who’d watched the movie along with me earlier that day. I sat down and began to share the two plots’ divergences. Despite my being floored by the generally grim mood of the book, it wasn’t my first time reading Valley. A co-worker lent me her copy at my first job out of college, swearing up and down that I’d love it. She was right, I did, but it’s the strangest thing—for the life of me, all I can remember are the scenes that line up with the onscreen version. Patty Duke as Neely O’Hara, being at once melodramatic, wicked, and adorable. Tony Polar’s secret, so well-hidden that even he doesn’t know it. The incident in the ladies’ room. I’d watched the movie not long after finishing the novel, and now, nearly a decade later, the movie was really all I remembered. I re-watched it with a sense of familiarity; I re-read the book as if I had no idea what would happen next. I suppose I didn’t. I tend to be a bit of a purist when it comes to the books vs. film adaptation debate. I know that plots must be chopped and compressed to suit runtime, and still I mourn every cut, so I’m left slightly bemused as to why I’m leaning toward the film’s fast-and-loose treatment of Jacqueline Susann’s show business epic. To be fair, both the book and the film are a bit exaggerated, to say the least. The dialogue is over-the-top, the twists are triple pirouettes. Still, they appeared to me at just the right time. I was twenty-one, supporting myself for the first time and loving every minute of it. Perhaps it’s only natural that I gravitated toward the sanitized film version, with its pure ‘60s glamour and Technicolor sets. What use did I have then for the second half of the book’s middle-aged regrets? I’m older now, but I’m still worlds away from what goes on between those pages. I’m still partial to the fun(ner) and fancy-free version. Of course, both the book and the movie have been blessed with lasting mass appeal, in spite of their questionable quality. Much like my first experience reading Judith Krantz, I found myself uneasy with the “trashy novel” label, the way it appears to be almost exclusively applied to women writers who produce the sorts of stories that thrill, delight, and charm millions. I did an informal poll among some bookish friends, all of which struggled to identify a book written by a man that classified as “trashy.” To be clear, they certainly exist. It’s just that they’re not typically termed as such in the public eye. 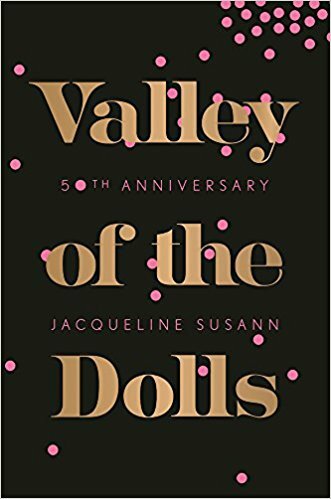 As campy as Valley of the Dolls may be, it’s fun to read and watch, which is a feat that so many reviewers seem to have taken for granted in their rush to condemn it for a lack of high-mindedness. Pure fun and technical perfection don’t always go hand-in-hand, but we rarely mock the latter if it doesn’t have the former. Considering the heavy thoughts that were initially stirred up when I began this month of books on film, it feels right to end on one that’s frothy and even funny in its attempts to portray despair. If going to the movies is going to be a source of anxiety for the foreseeable future, it’s comforting to know that I can lose myself in an endless archive of films that are available from the comfort and relative safety of my own home, and, every now and then, even more enjoyable than the book that goes along with it.